Now, people with mobility and hand dexterity issues can take advantage of our expanding line of personal care items including body scrubbers, nail clippers, hair trimmers and more. The Clothes Folder is a handy laundry folding aid that allows you to flip and save time in your busy day. Gain valuable space in your closets. Simply lay the item to be folded on the folder and with a few simple flips, in a matter of only a few seconds, it will be neatly folded. Not only will you save time and get perfect folds every time, but your clothes will be folded to a uniform size, saving space in your closets and giving them a neat, orderly appearance. Use the Clothes Folder on a countertop, table, bed or even on top of your washer or dryer. Its sturdy yet lightweight plastic design makes it easy to handle, especially for the blind and those with low vision, as well as senior citizens and those with dexterity issues. Measures 27-5/8" wide x 23-1/4" high when open. Folds down to 23-1/4" high x 9-1/2" wide x 5/8" thick for easy storage when not in use. Lay it flat on a shelf or slide it alongside washer/dryer. Weighs 1.75 lbs. Color: Blue. 60 Day Manufacturers Warranty. The Drive Medical Bariatric Platform Walker and Aluminum Crutch Attachment is designed for those users who are unable to grip the walker. 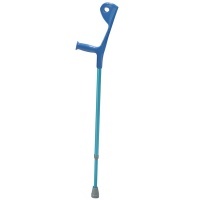 This universal platform walker and aluminum crutch attachment is built for use with adult and junior walkers and aluminum crutches. 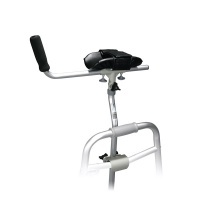 This walker accessory cradles the forearm with soft vinyl padding for comfortable weight bearing and the large top bracket allows the platform attachment to be placed over the hand grip of the walker. An adjustable strap securely holds the arm in place and the attachment has a Bariatric weight limit of 500 lbs. 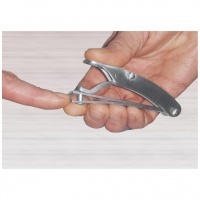 A next generation, improved design, nail clipper that has an extra forward leaning lever so that the user squeezes at the points closest to the cutting edges - where the fingernail or toenail is rather than squeezing from the opposite end of the tool. This design feels more natural in you hands and offers greater control and accuracy making it possible for young and old to use it with ease. It also folds up to fit in your pocket or purse and there is no issue bringing it through airport security. 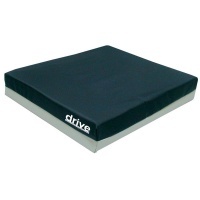 The Gel E 3 Wheelchair Cushion with Gel Bladder by Drive Medical is a pressure reducing cushion designed to assist in the prevention, treatment and management of pressure ulcers. The viscous gel bladder mobility aid provides optimized pressure reduction, support and comfort. The mobility accessory features polyurethane foam shell that is fire retardant. This mobility aid has a removable and replaceable water resistant top, and has a non-slip vinyl base ensuring users safety. 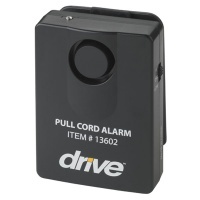 A more economical way to signal that a patient has moved and perfect for hospital and home caregivers, this deluxe pull-cord alarm from Drive Medical easily secures to a bed or chair with a self-contained clip. 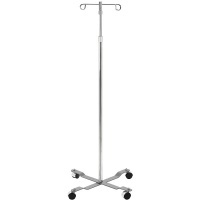 It features a pin-style activation cord (adjustable from 18" to 33") that pulls when the patient or user moves, dislodging the pin from the alarm unit and activating the signal. The alarm includes two volume settings (85 dB and 100 dB) and can be deactivated with the On/Off switch. This patient safety alarm also requires one 9V battery to operate, which is included. --Activation cord is adjustable from 18" to 33"
- The positioning strap with Velcro-type closure ensures a secure, proper fit for best possible treatment. - Ideal in the treatment of arthritis, back pain, sprains and strains, muscle soreness, neck pain, headaches and sports injuries. 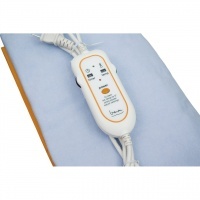 - The heating pad will automatically shut off after treatment. - 1 Year Limited Warranty. 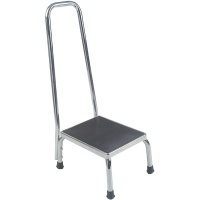 Chrome plated steel with weighted base provides strength, durability and reduces risk of tippng. 4 Ball bearing wheels provide a smooth transport and maneuverability. Locking collar allows for easy height adjustment. Removable hooks make this economy IV pole versatile. 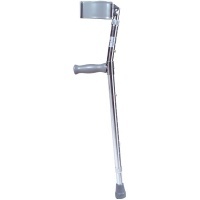 Chrome plated steel with weighted base provides strength, durability and reduces risk of tippng. Locking collar allows for easy height adjustment. Removable hooks make this economy IV pole versatile. Vinyl handgrips are comfortable and durable. Tapered contoured arm cuffs molded to user for maximum comfort and support. Vinyl handgrips. Steel welded chrome plated construction. Deluxe with handrail, 2/cs. Steel welded chrome plated concstruction. Non skip ribbed rubber platform. Reinforced rubber tips. Limited lifetme warranty. Vinyl coated, ergonomically contoured arm cuffs molded for comfort and stability. Leg and forearm sections adjust independently for optimal sizing. Patient Height Range: 5'10" - 6'6"
Ergonomically contoured arm cuffs are molded for comfort and stability. Leg and forearm sections adjust independently. Vinyl hand grips. Extra large tips. Limited Lifetime Warranty. 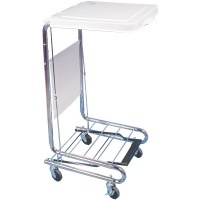 Handle to Floor Range: 33" - 42"
Glides easily with 3 locking casters. Chrome plated steel is attractive and easy to maintain. Non-slip peal raises the white, poly-coated steel lid. Non-slip peal raises the white, poly-coated steel lid.Lid measures: 18 x 19 1/2. Height:38. Chrome plated steel is attractive and easy to maintain. 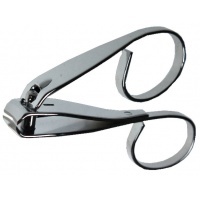 These easy to use, scissor-style nail clippers help ease the pain of repetitive clipping motions.